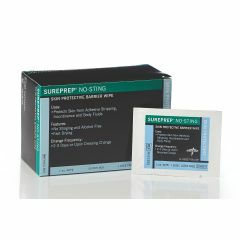 Sureprep No-Sting Skin Protection film is alcohol free and is for damaged or delicate skin. Protects from adhesive stripping 1,2. Outperformed 3M Cavilon in controlled trials4. Creates a waterproof barrier on periwound skin. Protection from friction and body fluids. Contraindicated for direct application to wound bed. 1. Chakravarthy D, Falconio-West M. A Randomized, Controlled Trial of Two Sting Free Polymeric Skin Barrier Products, One Water Based, the Other Solvent Based. Presented at Clinical Symposium on Advances in Skin and Wound Care. Nashville, TN. 2007. 2. Test data on file (independent lab). 3. 510(k) K051082, WOVE, 2005. 4. Shannon RJ, Chakravarthy D. Effect of a water-based no-sting, protective barrier formulation and a solvent containing similar formulation on skin protection from medical adhesive trauma. Int Wound J. 2009 Feb;6(1):82-8.